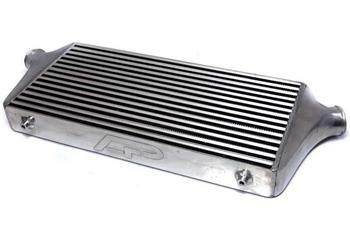 Agency Power Intercooler Kit - Dezod Motorsports Inc - Home of the automotive performance enthusiast since 2002. As you step up the power level on your vehicle, having proper cooling efficiency is mandatory to maximize your vehicles performance. Street and track cars will heavily benefit from the use of our upgraded intercoolers. Agency Power has developed these complete intercooler replacements for your ride with no modification needed. The bar and plate intercooler core is designed to provide maximum cooling efficiency .The end tanks are aluminum and then precision welded to the thick racing cores. The ends of the intercoolers are designed to work with factory intercooler piping or Agency Power Intercooler piping. These have been tested and provide a substantial horsepower gain on a stock vehicle. The intercoolers retain the factory mounting positions and come in a polished finished.